Insectronics is based upon the six-legged walking robot in the book Insectronics by Karl Williams. The robot uses a PIC microcontroller, the 16F84A, to control the leg movement and infrared or sonar sensors. The book is a good second step for the students as it provides an opportunity to use stationary power tools and it requires a basic knowledge of PIC Basic programming. 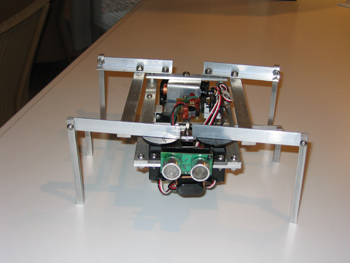 The programmable robot moves with three legs which are powered by servos. The servos are programmed at precise time intervals for it to walk forward, backward, and turn in either direction. Insectronics can be equipped with either an infrared or sonar sensor.